At the beginning of his presidency, Barack Obama traveled to Cairo, Europe and the United Nations to "apologize" for past American actions and attitudes, which he claimed helped create divisions between countries. At a town hall meeting before a mix of French and German citizens in Strasbourg, France on April 3, 2009, the president said the United States was partially to blame for increased tensions with Europe following the Iraq war: "there have been times where America (has) shown arrogance and been dismissive, even derisive" toward Europe. Mitt Romney and other critics quickly dubbed these and similar remarks his "apology tour." 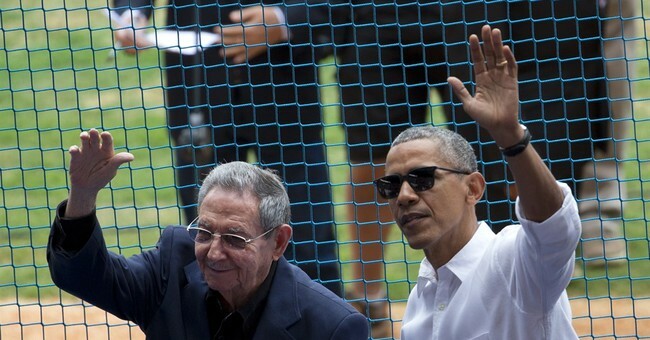 With the president's visit to Havana, Cuba, that tour has come full circle. In response to a question about Cuba's human rights policies during a joint news conference, Cuban President Raul Castro criticized the United States for what he asserted was America's violation of human rights. Castro engaged in a form of moral equivalency when he asserted that the denial of health care and education for all and "equal pay" for women was somehow similar to the jailing of political dissidents. Castro claimed Cuba pays women the same as men. Yes, and it is called equally shared poverty, which is a good definition of the communist form of government and its economic policies. In response to this smear, President Obama said, "I personally would not disagree with him." Score another propaganda victory for communist Cuba. Responding to a reporter's question about political prisoners, Castro seemed to channel "Baghdad Bob," the spokesman for Saddam Hussein, who claimed U.S. forces were not in Iraq as TV cameras showed them advancing on Baghdad behind him. Castro denied Cuba holds political prisoners, but then told another reporter, "...give me a list of the political prisoners and I will release them immediately." The reporter didn't have a list, but several human rights organizations do. Given Cuba's record of oppression (an estimated 50 human rights advocates were arrested prior to President Obama's visit and a "women in white" demonstration was broken up by police), the release of anyone from Cuba's notorious prisons is about as likely as a democratic political system sprouting up in the country to challenge the communist dictatorship. President Obama promised aid to Cuba, from help in connecting its citizens to the Internet, to trade. Business leaders who accompanied the president on the trip are anxious to build hotels and conduct other business in Cuba. The upside of this is that it might produce more openness in a society that has been closed for more than 50 years. The downside is that any prosperity will be used by the Cuban government to underwrite revolutions throughout Latin America; just as giving Iran its frozen assets will most assuredly facilitate the growth of terrorism throughout the world. While the light of democracy can dispel the darkness of dictatorship, a light can be extinguished if its power source dims. So far, the U.S. has received nothing in return for the president's initiative and his claim of a "new beginning" in the U.S.-Cuban relationship. The "new beginning" President Obama pledged for the Middle East in his Cairo speech has not reversed or even slowed the old turmoil that never seems to end. Will it be different in Cuba? From Raul Castro's remarks and the president's partial agreement with him, the signs do not provide cause for optimism.